More than 30 years of MASTERWOOD innovation, of programming experience, of processing knowledge , of practical experience and collection of customers’ opinions live in our software. Masterwood knows how to do it, so you don’t have to worry about it. Shortly, all what you need is an order from your customer. From design to disposition of pieces and underpieces on the bench, 3D automatic collision detection with simulation, machining optimization and program generation. - MASTERWORK: is a graphic programming system which allows to avoid the Iso programming thanks to an easy, fast and intuitive graphic interface. It&apos;s a real programming environment oriented to the work piece. It is a tool for all users, but specially dedicated to whom have no experience of programming. The MasterWork office version, allows the customer to generate the programs in the office and load them via internet or duongle key in the machine. Masterwork complies with windows standards and guarantees the immediate and easy understanding of all commands. - MASTERWINDOW: configure the parameters of all the elements that make a window. Masterwindow is extremely easy to use: the user is guided through all stages of design , from the shape choice to decomposition of the arcs in logs. 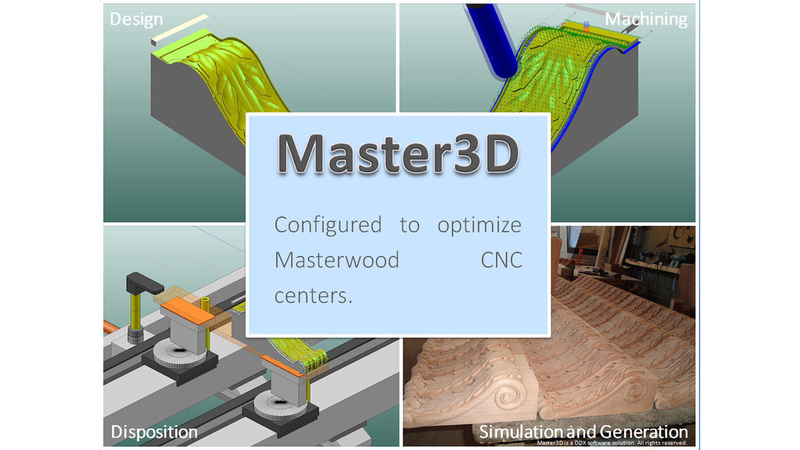 - MASTERCABINET: In order to achieve these goals Masterwood offers its customers MasterCabinet, a software that allows you to create every kind of cabinets in an intuitive and easy way. - MASTERNEST: Thanks to a "lean" approach, automatically generates the most efficient nesting configurations. The scraps are dramatically reduced, the tool life is optimized, the programming and production times are scheduled, the total cycle time is very fast.